Valentine’s Day—Its an excuse to get out and show a little extra love to your love. Picture this: after a beautiful day at the beach (having taken the shuttles of course), walking hand in hand with your better half, you work up a healthy appetite. You think “Good thing we already made reservations for the Valentine’s Day Dinner“, and it IS a good thing. This dinner will fill up fast. After a quick shower to wash off the salt breeze, and a luxurious couples massage from our Mother Earth Day Spa, you’re ready for a delicious Valentine experience. 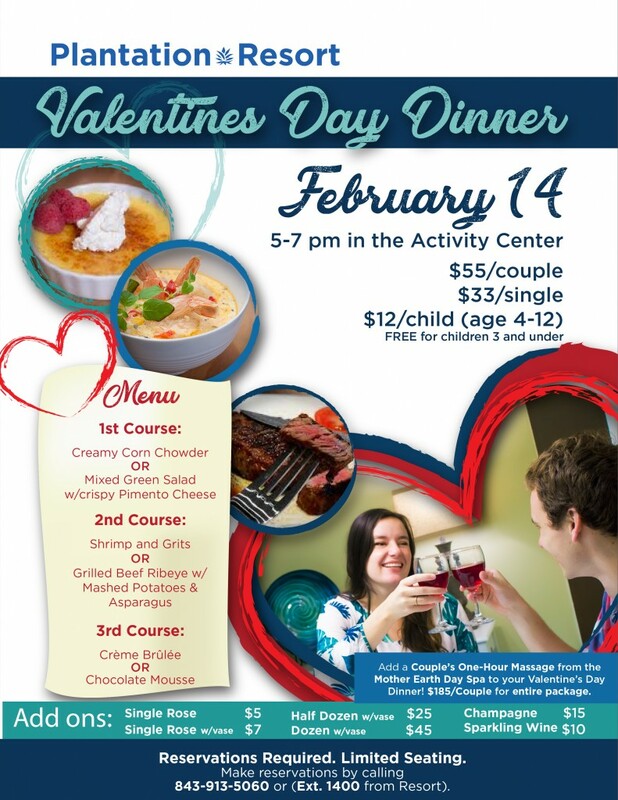 Here’s what you can expect from these Valentine’s Events at Plantation Resort. Corn chowder or mixed green salad with pimento cheese? First you’ll whet your appetite by choosing between a creamy corn chowder or a mixed green salad with a crispy pimento cheese. Shrimp and grits or grilled beef ribeye? Then it’s time to choose the main course: shrimp and grits (a Lowcountry staple) or grilled beef ribeye with mashed potatoes and asparagus. Crème brûlée and chocolate mousse? Yummm! Then, of course, the pièce de résistance of any meal is dessert, where you’ll choose between crème brûlée and chocolate mousse; or better yet, you each order one and then share. In addition to the dinner, you can upgrade your romantic getaway to include a couples massage (discounted with the purchase of the dinner) plus roses and wine or champagne. Go subtle with a single rose or grandly declare your love with a full dozen roses. See the flyer for the prices of these add-ons. 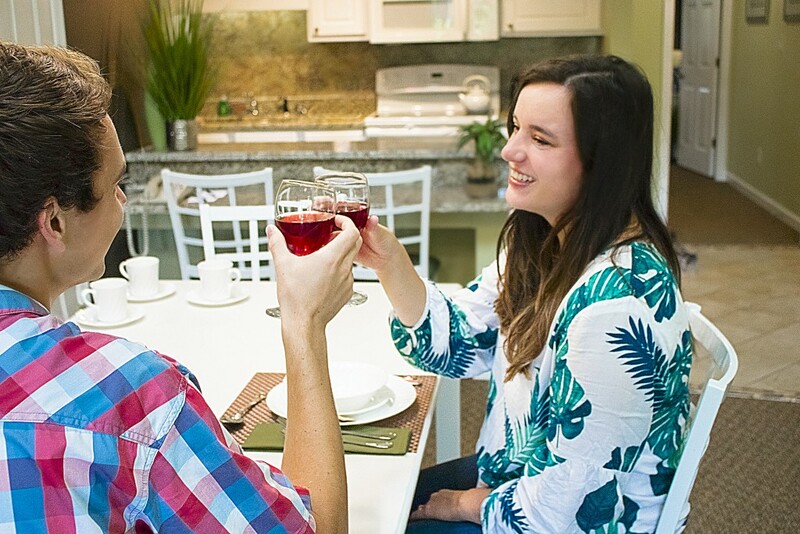 After such an enjoyable dinner, you’ll want to keep the party rolling into the weekend, and we love to accommodate! Reserve your spot at the Romantic Brunch for the weekend right after Valentine’s Day. On either Saturday or Sunday (or both), you’ll enjoy a delicious array of Southern breakfast staples such as biscuits and gravy, waffles, and grits. And you won’t want to miss the omelet station where you’ll custom design your own omelet! See the full menu below. These Valentine’s events are happening exclusively at Plantation Resort, so you’ll want to make your reservation as soon as you can. To make your reservation, please call 1-800-845-5039.